Warwick Rotarians heard from Michael Jackson, who contracted Polio when he was 2 years old, about the work of the British Polio Fellowship, where he helps as Welfare Officer. Polio is a dreadful disease which paralyses and kills. In 1988 as many as 350,000 children worldwide contracted polio. Rotary clubs across the world have made a concerted effort to eradicate the disease working with the World Health Organisation, Bill Gates Foundation and national governments which has brought new cases in 2017down to less than 40, with hopes to see the disease eliminated by 2025. The last cases of Polio in Britain were in the 1950’s leaving survivors now over 60 years old. Most have managed to live rewarding lives and are not visually identifiable from other people with disabilities. However, as they age many develop Post Polio Syndrome with increasing fatigue, sleeplessness, mobility and respiratory problems which may not be recognised as PPS. 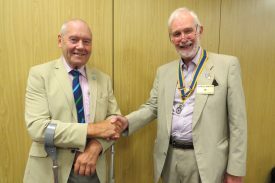 Mike told how a chance meeting with Rotarians in Northamptonshire led to a project to provide a hydrotherapy programme for 8 polio survivors. Rotary helped with the cost of the physiotherapist, and local Rotarians in Wellingborough help weekly with getting people into a warm hydrotherapy pool where a programme of exercises has been found to help mobility, confidence and respiration. Since the initial 8 weekly 30 minute session evaluation programme in early 2017, the group has now carried out over 60 weekly 30 minute sessions. Club members were spellbound wondering how this programme could be extended to provide an opportunity for more survivors elsewhere to benefit. The British Polio Fellowship is one of President David Smith’s charities for the year as he has a family member affected by the disease, and the Club has been involved for many years in the global campaign to eradicate the disease.